Blue Danube’s portfolio of Coherent Massive MIMO products includes single and multi-band beamforming antennas for cellular networks. BeamCraft active antenna products support FDD frequencies from 1.7 GHz to 2.6 GHz and are designed to fit in the existing antenna positions in the cell tower. 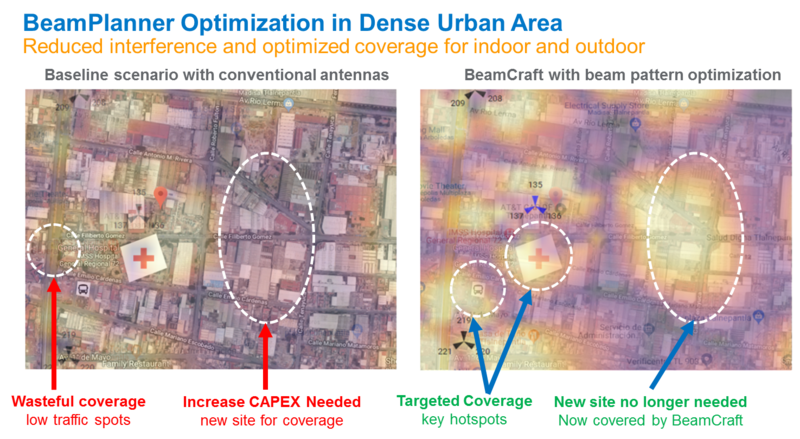 Programmable and agile beams provide unparalleled accuracy to focus spectrum power dynamically towards traffic hotspots and un- or underserved areas. Supporting variety of field applications from extending wide area coverage to vertical beamforming and time-of-day beam steering, the BeamCraft series provide flexibility for network planning and deployment as well as a range of performance improvements and increased capacity. BeamCraft 500 provides instant capacity uplift to FDD LTE networks and the newly introduced BeamCraft 600 is ideal for multi-band and multi-standard deployments. Both can be equipped with optional integrated low band passive antenna. The company’s first product deployment, BeamCraft 500, features 96 active elements and radios with a total maximum output power of 160W. Packed into a panel measuring just 72” x 14” x 10”, BeamCraft 500 can be easily mounted onto existing antenna locations on both towers and buildings. BeamCraft 500 is fully compatible with today’s LTE standards and with existing mobile devices. The product supports all three major FDD frequency bands (AWS, PCS and DCS) and is customizable to meet operators’ varying requirements. 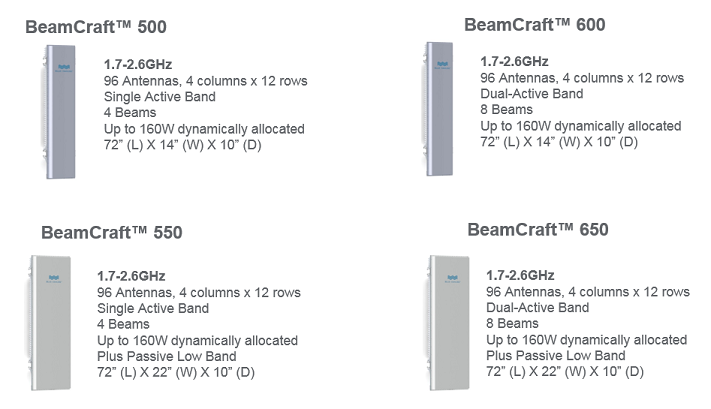 BeamCraft 600, the company’s second-generation product, extends support for 2.6 GHz bands and doubles the number of beams to 16. BeamCraft 600 also supports simultaneous beamforming over multiple FDD frequency bands and multi standard deployments including 3G/4G, allowing operators to deliver increased capacity with the same compact form factor. BeamCraft series includes an option for integrated passive antenna for low band support. BeamCraft products are highly customizable to meet operators’ varying requirements for frequency bands (both FDD and TDD), form factors, weight and output power. BeamPlanner™ is a cloud-based planning, optimization and management software for beamforming antenna systems. 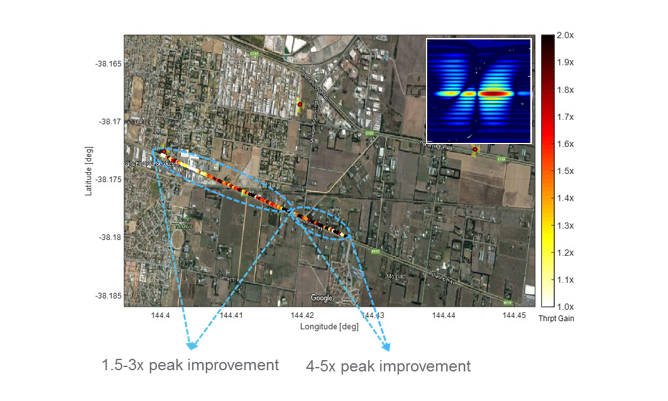 BeamPlanner utilizes artificial intelligence and machine learning techniques to predict traffic patterns and optimizes wireless capacity and coverage. It dynamically responds to traffic demand and directs RF energy towards hotspots while steering clear from interference. BeamPlanner also enables vertical beamforming to address coverage issues common in high-rise buildings. The versatile solution can create arbitrary beam shapes from vertical wide beam to cover a tall building or sharp pencil beams to only focus on users in certain floors. Controlling beam power and shape allow signals to reach users behind thick walls without resulting in excess interference in the surrounding area. In this way BeamPlanner enables agile multi-dimensional radio operation to maximize user experience at special events or provide capacity based on time-of-day movement of mobile users. This virtualization of the network RF functions enables management and optimization of multi-site BeamCraft deployments leading to improved end-user experience and increased overall network capacity. BeamPlanner integrates seamlessly with wireless carrier’s existing RF planning workflows.